Alba (Fabbrica di Automobili Alba SA), baised in Trieste, built cars form 1906 to 1908, by the will of a group of car enthusiasts and financiers, among them Edmund Richetti2 and Modiano3 Hector, was born with the double name of Alba Fabbrica Automobili SA and Alba Automobilwerk Aktiengesellschaft, the first factory for the construction of cars in Trieste. The first few models produced were the 18/24 hp and the 35/40 hp designed by the Technical Director, Engineer S. Bauer. This model features a 4 cylinder 6868 cc engine with a vertical with shaft drive, 4 speed gearbox plus reverse and speeds of up to 97 km/h. 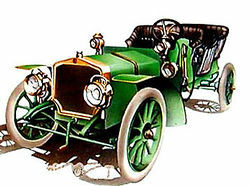 In 1907, the company put together the Tipo 6.8-liter without a body (chassis, engine and mechanical only) for the Paris Motor Show. Four types were produced until 1909 and sold until 1911. Alba had already declared bankruptcy at the end of 1908.